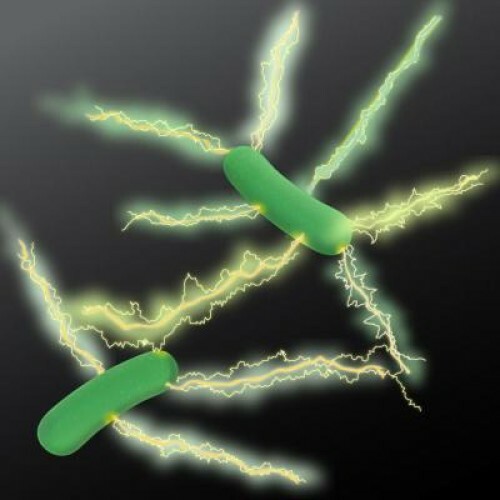 The claim by microbiologist Derek Lovley and colleagues at the University of Massachusetts Amherst that the microbe Geobacter produces tiny electrical wires, called microbial nanowires, has been mired in controversy for a decade, but the researchers say a new collaborative study provides stronger evidence than ever to support their claims. UMass Amherst physicists working with Lovley and colleagues report in the current issue of Nature Nanotechnology that they’ve used a new imaging technique, electrostatic force microscopy (EFM), to resolve the biological debate with evidence from physics, showing that electric charges do indeed propagate along microbial nanowires just as they do in carbon nanotubes, a highly conductive human-made material. Physicists Nikhil Malvankar and Sibel Ebru Yalcin, with physics professor Mark Tuominen, confirmed the discovery using EFM, a technique that can show how electrons move through materials. “When we injected electrons at one spot in the microbial nanowires, the whole filament lit up as the electrons propagated through the nanowire,” says Malvankar. Previous Post Modeling tumor dormancy: What makes a tumor switch from dormant to malignant?